These tow hooks make it easy to trailer load your car, and for the racer, a tow point to get you out of the sand. 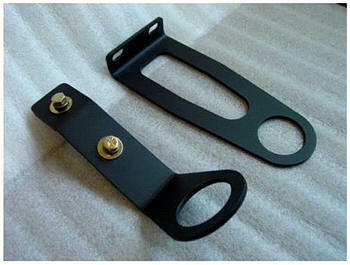 The front tow hook mounts to existing bolts, and takes less than 10 minutes to install. The rear hook requires 2 holes to be drilled into the lower rear frame rail. Unlike other rear tow hook kits out there, this uses a sandwich design which will not collapse the frame rails due to no internal box support. Installation on this kit is easier because you are not trying to drill through two sides of the frame rail at an angle.